9x23 Winchester ammo is a unique round. It was designed solely for competition shooting to replace the 38 Super. While the 38 Super has long been the preferred high velocity, flat shooting, and accurate round for competition. The 9x23mm Winchester, unlike the 38 Super, was designed from the ground up as a competition cartridge. This gives the round a distinct advantage being such a purpose built round. While the 9x23 round has the same dimensions as the 9 x23 Largo, the rounds are not interchangeable and the 9x23 Win is much more powerful than the much older 9mm Largo. The round delivers near .357 Magnum performance from an automatic pistol. The 9 x 23 Winchester has to be chambered in a full sized frame, like the 1911 platform. The 1911 is the preferred handgun for open class competitions, so the 9 x 23 mm goes hand and hand with it. 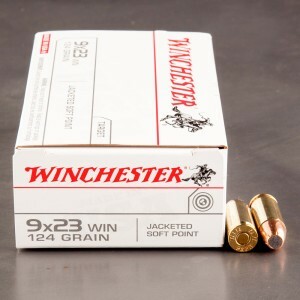 While 9 x 23 mm Winchester ammunition is most associated with scoring and sport shooting, it quite potent as a self-defense cartridge. The round is capable of exceeding 1,400 feet per second with a 124-grain hollow point round. This beats rounds like the .357 Sig cartridge in feet per second performance, and the straight walled designs makes it much easier to reload. Since the round does not have a large diameter the user has more capacity than a 45 or even 40 S&W, with a much higher velocity.